Harriet Tregoning, a rock star in the world of smart growth and urban planning, took the helm of HUD’s Office of Economic Resilience (OER) last year. Formerly known as the Office of Sustainable Housing and Communities, OER helps cities, towns, and counties build a strong foundation for a diverse and prosperous economy by enhancing quality of place, economic opportunity, fiscal stability, transportation choice, and affordability. 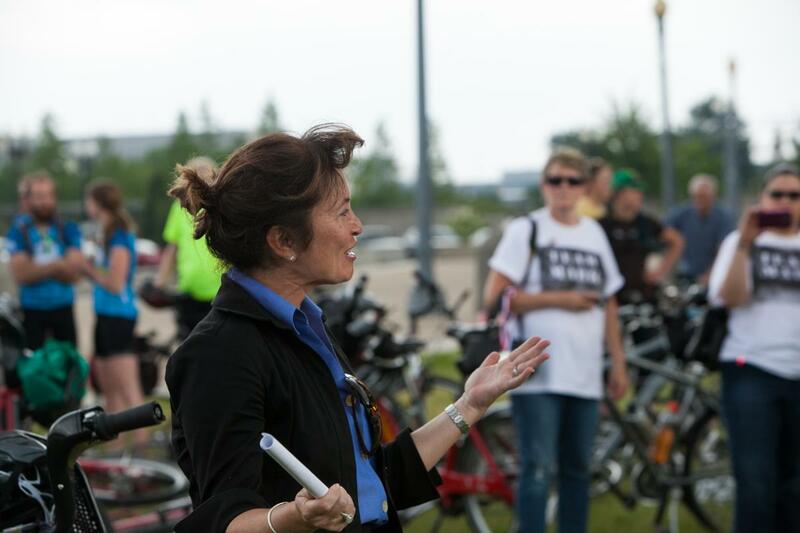 Before joining HUD, Tregoning was director of Washington, D.C.’s Office of Planning, where she worked to make D.C. a walkable, bikeable, globally competitive, and sustainable city. She was the director of the Governors’ Institute on Community Design and cofounder, with former Maryland Gov. Parris Glendening, of the Smart Growth Leadership Institute. She served Glendening as both secretary of planning and then as the nation’s first state-level cabinet secretary for smart growth. Tregoning is also an avid bicycle commuter, who really wishes that someone would invent a foldable bike helmet. Q. Throughout your career, you have worked under the banner of smart growth and sustainable development. How is resilience different from those two concepts? A. Resilience is really focused on shocks and stresses. While not geared toward any single shock or stress, resilience is part of a recognition that the future is going to be considerably different than the past. Resilience favors diversity. It favors more choices. It favors innovation. It favors social connectedness and cohesion. It must focus on the most vulnerable geography and the most vulnerable people, because how people fare in the event of a shock of some kind is extremely different based on whether they have the resources to bounce back. Resilience can be thought of as a place-based attribute, but places don’t have these qualities unless they are very deliberate about it. It’s almost never the automatic byproduct of a laissez-faire market-based system. Communities have to decide what kind of future they want to have, and then they have to make very difficult and deliberate changes to get these sustainable smarter-growth outcomes. That’s absolutely true for resilience as well. The better and more inclusive the process, the better the outcome. There is a lot of overlap: Many of the things that make a community walkable, livable, economically competitive, sustainable, and equitable will also make that community resilient. For example, those transportation choices that make you so attractive to the knowledge economy are awfully helpful when you have to evacuate your community. Q. Because they’re more diverse — so if one goes down, others are still functioning? A. Yes. It’s that, but it’s also an issue of capacity. We haven’t sized any of our infrastructure so that everyone can go in the same direction at once, by any mode. If you have bike lanes and bicycles and lots of people used to taking them along with transit, then you really have a lot more capacity. Think of Houston after Hurricane Irene. Some of the biggest-sized highways in the country, and it was a parking lot. In the weeks after Hurricane Sandy, your most viable way to get around was by bike. Those things that make for a walkable, wonderful, livable community every day also stand you in good stead in terms of resilience. Q. When you think about what makes people and communities resilient, it seems the answer is both broad and deep. There’s a broad array of factors that matter: social, environmental, the built environment. There are deep-rooted issues, as you said earlier, that have to do with people’s differential vulnerability to disaster. How do you address this issue in a way that’s appropriately broad and deep and still get stuff done? A. To get specific, we’re running a $1 billion National Disaster Resilience Competition. We are partnering with the Rockefeller Foundation, which is putting $5 million worth of technical assistance into the first six months of the competition. They’ve been doing a series of “resilience academies” around the country to help the applicants think broadly and deeply about resilience. In the academies, a lot of focus has turned toward underlying conditions: poverty, segregation by race and income, unemployment, and lack of access to the basic needs of life – such as jobs, health care, and educational opportunities. Addressing those fundamental conditions is an important part of making a community more resilient. The resilience frame has been demonstrably useful in raising these issues that have sometimes been very hard to address. The notion that is also very much a part of this competition is that resilience isn’t just about preparing for some future unexpected event. It’s about investing in your community in a way that brings you benefits every single day. Why would we ever again build a berm or a levy if a waterfront park would give us the same protection from flooding? That waterfront park is a community amenity. It might help to revitalize a distressed neighborhood. It provides those benefits every single day. We really can’t afford to build single-purpose investments when we have such great needs in so many communities. It’s about how do we get the most out of every dollar that’s spent and how do we bring the greatest number of benefits out of these investments? Our hope for this competition is that everyone comes to see that the real money isn’t our $1 billion but the many billions of dollars that states and localities are spending every year, and how that money could also be invested differently to give them resilience benefits and dividends that they’re not currently receiving. Q. You’re a seasoned veteran of debates over revitalization and gentrification. Of course, some have argued that the creation of bikeable, walkable, green downtowns has come at the expense of displacing long-time low-income residents. How do you see that concern, and is this an issue that surfaces again in the resilience work? A. I always find it so interesting, the notion that if you invest in a neighborhood, that’s a bad thing. That our strategy for affordability should be a disinvestment strategy. No amenities, no choices, no access – that’s our affordability strategy. That on its face doesn’t seem remotely reasonable, but at the same time it is true that communities and neighborhoods with these kinds of amenities are in short supply relative to the demand. Those neighborhoods become more desirable with those amenities, but they’re also desirable to the people who already live there. As I was saying before, you don’t get a walkable, livable, sustainable community automatically as a byproduct of the free market; you have to be deliberate about it. You have to also be deliberate about ensuring permanent long-term affordability in those neighborhoods. You can do that by using zoning controls, by ensuring that your subsidies are in place, by using the property you own as a locality to guarantee long-term affordability. Q. When I look at what needs to be done to make communities more resilient, it seems that there are some fairly major changes that need to be made. Where will the push to make those kinds of changes come from? A. Some of it comes from the shock of the events themselves. It’s the 10-year anniversary of Hurricane Katrina this year. We’ve had some very big and costly disasters in the last 10 years. There were more than 200 presidentially declared disasters just between 2011 and 2013. Hurricane Sandy, in particular, was the second most costly disaster we’ve ever had. It affected the East Coast in a way that was, frankly, shocking to the communities and the states that were so impacted. I think every event is an opportunity for people to say, “Wait a minute. We weren’t prepared, and this could happen again. How can we get more prepared?” I think people are getting more sophisticated. Whatever the next event will be, it won’t be exactly like the one we just had. How do we more broadly prepare for this more uncertain future, this more extreme weather, these rising sea levels? That conversation doesn’t necessarily happen in the immediate wake of disaster. It’s actually an awfully hard conversation to have right after a disaster because it’s the normal human impulse to want to try to return to the previous state as soon as you can. You want to feel normal again. You want things to return to where they were. It either takes a prepared mind before a disaster or some amount of time to have passed before you’re ready to say, “Wait a minute. We have a lot of long-term recovery resources coming to our community. We need to do better than just building it back as it was.” Q. Any final thoughts? A. I do think that climate change is one of the most enormous challenges of our time. I don’t always talk about climate change when I talk about resilience, but those two things are very closely linked, at least in my mind. I feel like it’s a great privilege and honor to be able to have any role in addressing those issues. I’m trying to bring everything I’ve learned in all my many other jobs to bear at this moment, grappling with this set of issues.